The British Gardener - The Tropical years: Apocalypse now for Impatiens? Just when you think you're getting ahead in the garden, along comes the next big epidemic. I was first alerted to this new plague by numerous articles beginning to appear in the UK's Royal Horticultural Society's magazine, ' The Garden'. This time the target is one of our beloved little summer annuals, often referred to in England as 'Busy Lizzies', or Impatiens walleriana. Downy Mildew has always been a minor problem of Impatiens, but had remained at low levels for quite sometime. Chemical sprays had always kept Downy Mildew in check, but the frequency of the pathogen increased through Britain in 2007 and 2008. In 2011, things took a turn for the worse as the pathogen developed resistance to chemical treatments and more outbreaks occurred without a means to curb the spread. 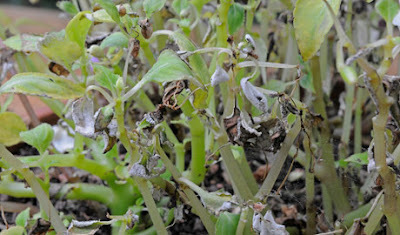 This strain of Mildew is related to phytophthora, found in both Tomato and Potato blights, but not however related to common powdery mildew. The spores that spread this disease develop on the underside of the Impatiens leaf, traveling from plant to plant by water splashing or even longer distances via wind. It becomes particularly bad in wet summers where the pathogen requires extended periods of leaf wetness to produce spores. The double whammy comes from the ability of the spore to survive in the soil for several years, causing reinfection to subsequent plantings. Symptoms include, white undersides of leaves where the spores are produced, few or no flowers and leaf drop, revealing only bear branches with tufts of yellowed leaves and flower buds. Inevitably the plant cannot sustain itself and succumbs to the disease. Unfortunately there is no treatment available to home gardeners and infected plants should be securely bagged and discarded in the trash, but never composted. 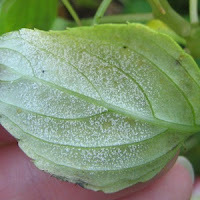 Confirmed cases of Impatiens Downy Mildew have been reported in 25 states, up and down eastern North America. Greenhouse Grower magazine reported in February 2012, that in North America, Impatiens sales rank 4th in total sales of bedding plants sold across the nation. From the article, a 2010 Floriculture Crops Summary reported that 8,676,000 were sold in flats; 2,338,000 in hanging baskets and a further 26,371,000 as potted plants across USDA's 15-state sample. With such high numbers of Impatiens being sold, an outbreak could spread across the U.S. just as quickly as it did in Europe. So what can be done? Routine inspections followed by quick removal, avoiding overhead irrigation, increasing air flow and avoiding replanting in known infected areas will help reduce the risk. Despite best efforts, many nurseries and garden retailers in Britain, including the big box stores are stopping the sale of Impatiens walleriana. It's a bold move when you consider that the total industry sales is estimated at up to 40 million pounds sterling ($63 million). Perhaps we should follow suit by begining to promote alternatives, that way, when the inevitable happens, substitutes are ready to go. All members of the Balsam family may be at risk, although New Guinea Impatiens do not seem to be affected by this pathogen. 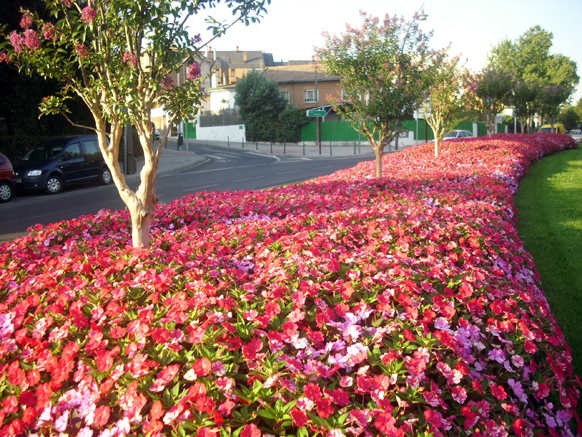 Work is being carried out on a new line called 'Sunpatiens' that have trialed successfully in the same beds where Downy Mildew was found. However, there still remains a risk that the disease could adapt again, and until the SunPatiens have been exposed to higher levels of the disease for longer periods of time, it's impossible to tell how robust it will be. I really like impatiens so this is fairly rotten news. :( But I've already seen pictures of Sunpatiens and they sound promising. How many individual plants do you think are planted in the bottom picture? My guess - a lot! My prayers have been answered, kind of!